Reports by analyst firms show growing investment in 3D, despite slow start this year. Samsung continues to lead in 3D memory, but IM Flash, Sk Hynix, Toshiba/SanDisk also plan to move to 3D technology within the next couple years. Fig. 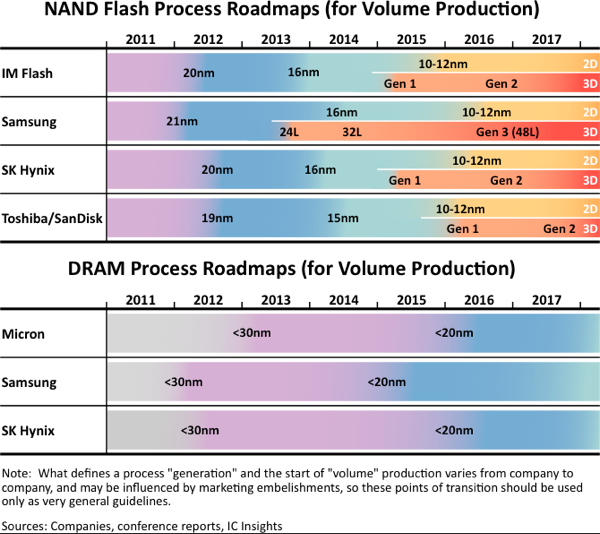 1: NAND flash and DRAM roadmaps for volume production. Source: IC Insights. From a refinement standpoint, Toshiba/SanDisk is the current market leader, but this group is behind everybody else in 3D technology (Figure 1). Samsung began to use 3D technology in 2013, whereas IM Flash and SK Hynix will start in 2015. Toshiba/SanDisk is planning to use 3D technology at the beginning of 2016. Samsung began its low-volume production of SSD with integrated 24-layer 3D NAND flash in 2013. It also announced 32-layer V-NAND chip in May 2014. At the same time, it announced “the premium SSD” product that integrates a second-generation 32-layer chip. The premium SSD works for data center storage as well as for high-end computers. Samsung has high hopes for this market. The company expects the market to grow by 20% in 2015. Citing a report by DRAMeXchange, Samsung noted that 3D NAND will only account for 3% of the NAND market this year, despite a 46% in NAND sales due to the popularity of solid state drives. SanDisk was scheduled to use the 15nm-16nm process following the 19nm product, but decided to review the design of the memory cell instead. This led to a successful 25% reduction in the cell size while maintaining 19nm. Its initial plan was to have a 1x-nm device in late 2013, but the company decided to focus on advanced cell design instead of refining the product. DRAM is not pulling refinement at all. Currently DRAM makers use a 20nm unit process. From a 3D technology aspect, DRAM uses a chip accumulation system instead of monolithic multi-stage approach. 3D DRAM is implemented by the Hybrid memory Cube consortium, with through-silicon vias to connect the various chips. HMC was first introduced by Micron and Samsung, but the alliance has grown to include Altera, ARM, IBM, Open-Silicon, SK Hynix and Xilinx.